Not long ago, a coffeehouse was, well, just a coffeehouse. Think “Central Perk” from “Friends.” Think about the coffeehouses that dot university towns, with stressed out students sprawled out on couches and fliers covering every inch of the walls. A coffeehouse was a meeting place and a place for reading. As time went by with the wi-fi generation wanting coffee to go with their Facetime chats or work on their laptops, the coffeehouse became a de-facto anti-social computer lab, the complete opposite of the social epicenter that coffeehouses once were. Would you like some bike and sugar with your coffee? What to call a nondescript Starbucks or Peet’s? They are what they are, the same in Topeka or Temecula. They are somewhere in between a coffeehouse and laptop center, where at least half the customers don’t even consume the coffee on the premises. With the rise of the “Third Wave” coffee movement (a global movement of local, small batch coffee roasters who seek out higher quality beans and often have their own cafés) over the past decade, the actual coffee has been surging in quality. In turn, the idea of a coffeehouse has had both a renaissance and a complete re-imagining. These are the cafés where your barista is both expert and artist, where your precious Ethiopian single origin pour-over arrives ten minutes and five dollars later, and where your espresso’s blend has been sorted with the meticulous care a fine Bordeaux winemaker will do with his grapes. To accompany the loftier coffee, coffeehouses, including Sightglass and Four Barrel in San Francisco, now are combating the anti-social laptop crowd by not having wi-fi available. 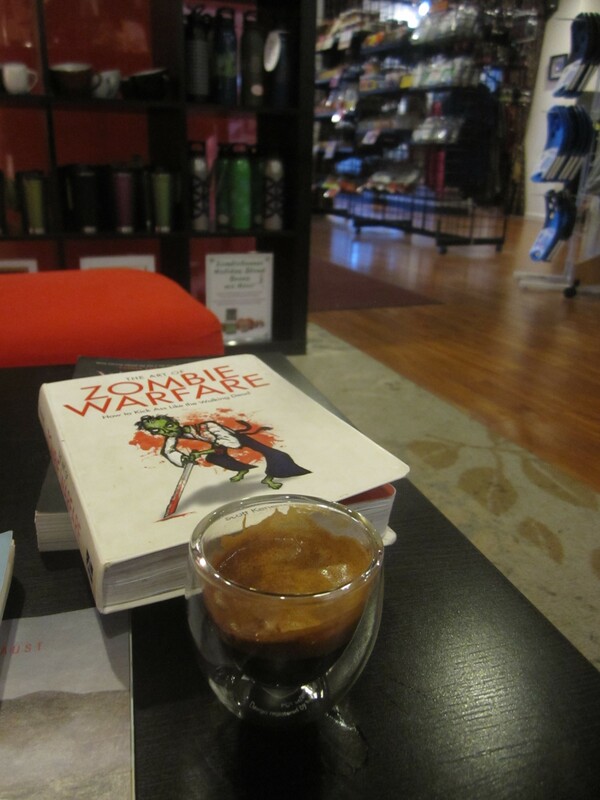 Here, it’s about socializing, reading, and of course, the coffee. Yet in the past few years, the concept of the coffeehouse has been taking an even more peculiar turn. Forget about the old coffeehouses of couches and tables. 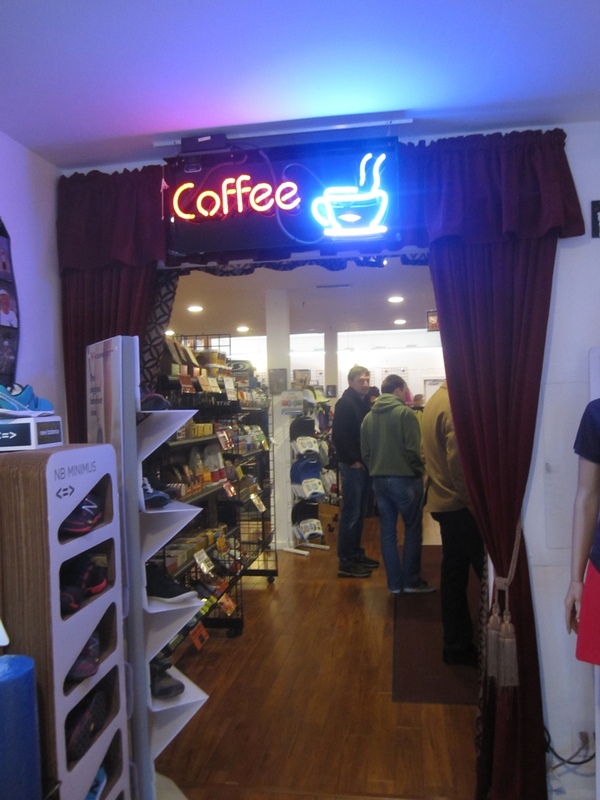 Welcome to the generation of where bike shops and running stores co-exist with coffee shops. In many cases, these hybrid shops even roast their own beans. One thing is for certain at these “cycle cafés” and “jogging cafés,” you will be wide awake for that next bike ride or run. The concept really hit me last year during a trip to Portland, Oregon. 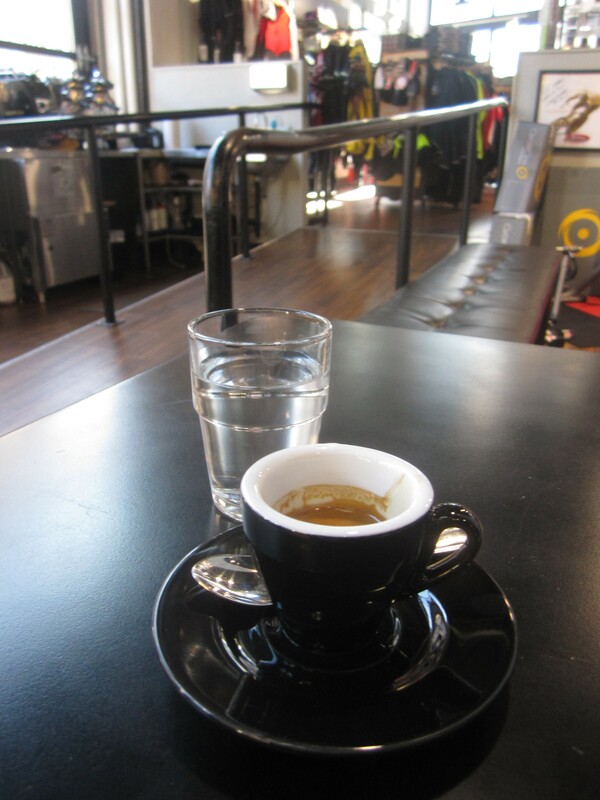 In a city with no shortage of coffeehouses and bikes, the most impressive coffee I encountered blitzing the city’s cafés was a powerful, incredibly focused single origin espresso shot pulled at Maglia Rosa, using beans roasted by Stumptown Coffee Roasters. 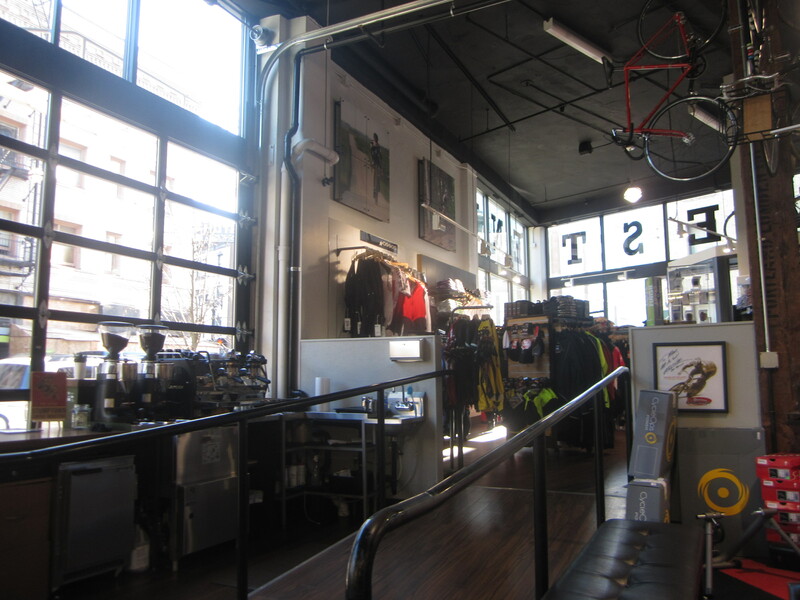 Maglia Rosa resides inside one of the city’s newest and sleekest bike shops, West End Bikes, one of the new anchors of Downtown Portland’s re-vitalizing West End District. “Maglia Rosa” is Italian for “pink jersey,” awarded to the leader of Italy’s premier bike race, the Giro d’Italia (think the yellow jersey for the Tour de France). Former U.S. champion barista Phuong Tran is the driving force behind Maglia Rosa and the quality of the coffee prepared by her team of baristas proves that championship was no fluke. 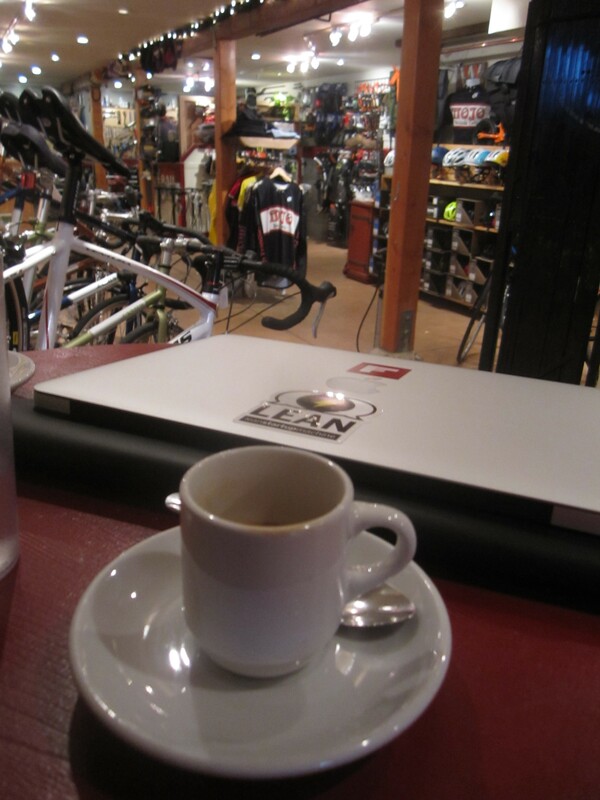 But, championship winning coffee inside a bike store? Maglia Rosa is essentially a magnificent prep area with the ubiquitous La Marzocca espresso machine (can you imagine La Marzocca’s profits because of the “Third Wave” of coffee?) and two or three tables. It’s about 1/8 of the store. The rest of West End Bikes is for, you guessed it, bikes. Does the focus on bikes affect the coffee? Not at all. Maglia Rosa certainly is not the first of these “cycle cafés,” where you can buy your bike or a new tire with top tier espresso being pulled for you. Sedona Bike & Bean in Sedona, Arizona claims to be the original café and bike shop in the U.S. A 2010 Financial Times article featured four cafés in London that also serve as bike shops. The Angry Catfish opened in Minneapolis also in 2010, blending Intelligentsia coffee with cycling. Now, cafés and bike shops are sprouting up everywhere. The Red Lantern is a runaway favorite that roasts its own beans in Brooklyn’s Fort Greene neighborhood. Chicago got its first of this hybrid breed last year with The Heritage Store in the city’s Lakeview neighborhood. I can’t imagine how popular the Juan Pelota Café inside Mellow Johnny’s Bike Shop in Downtown Austin was this past week with the annual South by Southwest Conference. Like Maglia Rosa, Juan Pelota’s serves Stumptown roasted beans. 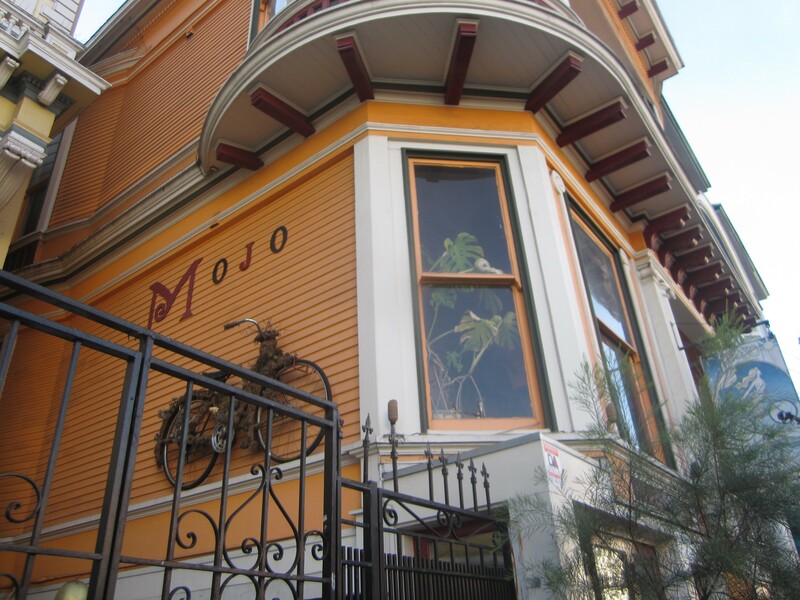 In San Francisco, bikes and beans mingle together in the NoPa neighborhood at Mojo Bicycle Café. Unfortunately the Four Barrel roasted coffee here is not exactly up to the high standards prepared by baristas at Four Barrel’s Mission District café (dreadfully watery espresso at Mojo), you can enjoy excellent sandwiches and a Moonlight Brewing “Death and Taxes” after browsing the bikes in the back. Unlike most of these cycle cafés where the bike shops seems to be the centerpiece, at Mojo you walk through the café portion to reach the bikes. The best time to visit the Mojo Café is Thursday nights when the bike shop is closed, to enjoy the weekly Vietnamese street food pop-up dinners known as “Rock, Paper, Scissors,” run by two sisters in Mojo’s tiny kitchen. The pho and banh mi might be double to triple the cost of what you’ll find in the Tenderloin, but I would not hesitate to call them twice to three times more impressive, and quite possibly the best in a city with stiff competition. This is not just an American trend, as proven by the article on London cafés and cafés in other cities such as Lola Bikes & Coffee in The Hague, Netherlands. Strangely after two weeks last year in Scandinavia, I could not find any bike shop-coffee shops, despite the region’s fervent passion for everything bikes and coffee. I would be shocked if such a concept doesn’t exist in Copenhagen. So, what does this tell us about the status of coffeehouses? Customers still socialize at these places and drink coffee. Coffee and biking have always been connected, whether it’s as fuel before a ride or a post ride cool down (or warm up). What we really learn from this evolution is how the idea of cafés, bars, and restaurants continues to evolve into what you want them to be. Anything can be anything. We have our pop-up restaurants that exist, but don’t exist. We have our cafés that are cafés, but not really cafés. You won’t mistake any of these “cycle cafés” for Tortoni in Buenos Aires or Les Deux Magots in Paris. We like to be flexible and comfortable it appears these days, two concepts fully embraced by these new coffeehouses. We love high quality coffee too, no doubt about that. 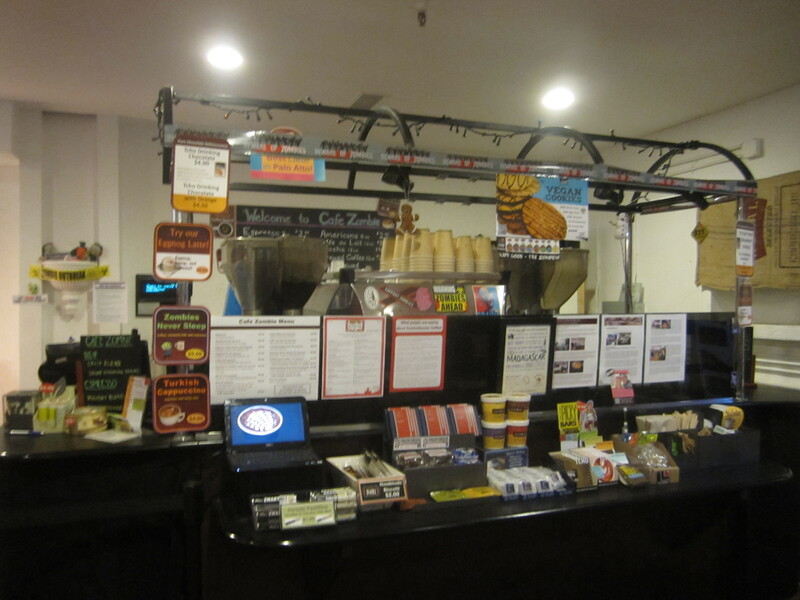 Zombie Runner has become yours truly’s and many of the area’s tech workers’ primary local café because of the affable baristas (a concept not often found at the aforementioned cafés) and the exceptional coffee. 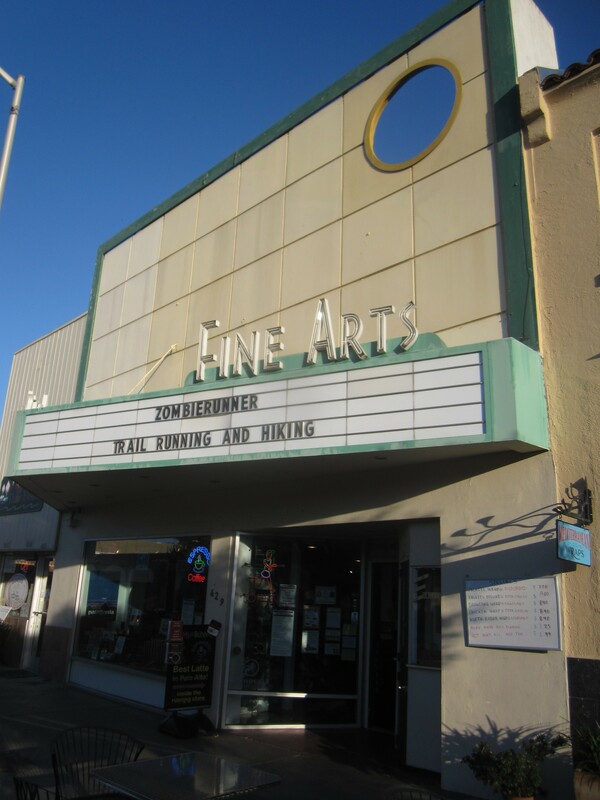 Zombie Runner roasts its own beans in the neighboring city of Mountain View and sells its beans at the kiosk, alongside your granola bars and other necessary re-charging bites post- jog. And, the next frontier of coffeehouses with biking or jogging themes? Why of course, a house with no roof at all. San Francisco’s Bicycle Coffee is not a café, but a bike itself that delivers your coffee by bike, roasted by them. The days of people-watching cafés might be waning. Today, you need to run or bike for your latte. This entry was posted on March 12, 2013 by trevsbistro. It was filed under Chicago, Insight, New York City, Palo Alto, Portland, San Francisco .